Hear all about the new direction of Nike's Shox platform in this exclusive interview with the Nike Basketball team. As Nike Basketball Senior Product Line Manager (and owner of a lengthy job title) Charles Williams explains it, "This is not your father's Shox." For one, we live in a footwear world where every ounce counts. Shox, in their traditional form, also happen to be perceptively more firm than the more sculpted and radiused foam-based midsoles that we've all enjoyed playing in lately. Logically then, four decently sized columns of solid polyurethane with a plastic moderator plate sandwiching both sides of the heel unit might not even deserve a presence in today's industry. As footwear evolved, Shox had become, in the words of many at Nike, too costly, heavy and firm for today's athlete. To figure out exactly how the new Shox Hyperballer, still priced relatively high at $160, moves the needle for mechanical cushioning in hoops, we recently caught up with Nike Basketball Design Director Leo Chang, Nike Senior Product Development Manager Tom Wray and Senior PLM Charles Williams to hear all about the development process that hopes to usher in a new era of Shox. Nick DePaula: How’d the Shox Hyperballer come about, and where does it fit into the line this season? 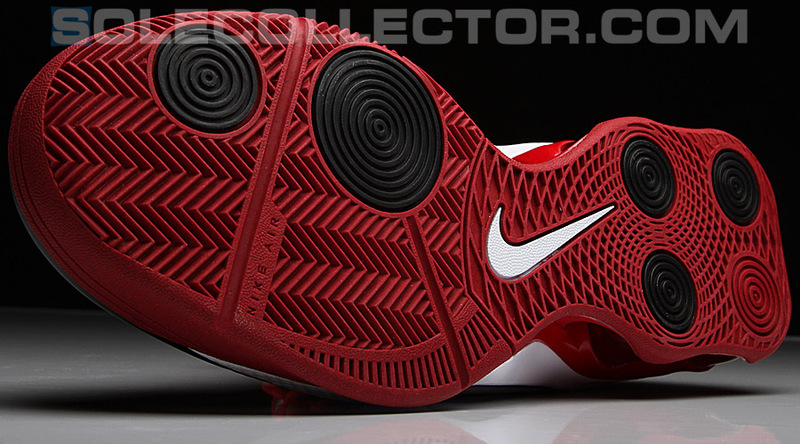 Charles Williams: Well, I tried my hardest to name this shoe the Max Hyperballer, because this is a Max shoe. If I could do a marketing campaign for this shoe, the tagline would be, “This is not your father’s Shox.” That was the whole premise with this shoe, to make it different. I got a brief from my boss’s boss’s boss, and the idea was, “We want to re-introduce mechanical cushioning.” We think there’s a consumer out there for it, and there’s a few other categories, specifically Running, that has done pretty well with it. Shox in Basketball has a heritage already, and everyone can remember when they first came out. I was a Sales Associate at Niketown Chicago when the Shox BB4 first came out, and I was right with all of the consumers that coveted that shoe. NDP: So you had the mechanical cushioning directive from the top. How long ago did this project begin then? Did it start out in the Innovation Kitchen? Leo Chang: Well, T-Wray worked on the first Air Shox shoe a few years back that never made it out, and that was actually for Fall ‘10. Tom Wray: That was a long process and got dropped, but yeah, Innovation had started the whole Air Shox concept, and it began as a corporate initiative that Nike Running took to market first. We tried to get on it and there were a whole bunch of things that held it back, whether it was weight, consumer relevance or costing. There was just the whole issue of basketball consumers having a sour taste in their mouths with Shox. In my simple mind, I too tried to think that we maybe shouldn’t even call it Shox -- call it Max Air something. There’s a Max Air bag here in four pods, and it’s not Shox anymore and it’s not going to play like Shox. It’s softer, more cushioned, more responsive and has better transition. Unfortunately, there was a connotation around Shox that it was going to be firm. The other factor is the costing aspect, and the number of molds that it takes to build the platform. It’s pretty amazing, and it’s about nine pieces to put that bottom together. He started really working on it, and one of the things that he was really able to pull off, that I hope consumers can appreciate, was bringing that heel stability wedge in quite a bit. It used to sit way out here [points wide]. [laughs] I was actually shooting to lose that tail altogether from an aesthetic perspective, but for basketball, there’s no possible way you can lose that. In Running, they don’t use a tail on their columns, but basketball has more impact forces from landing after a jump, and you definitely need it. 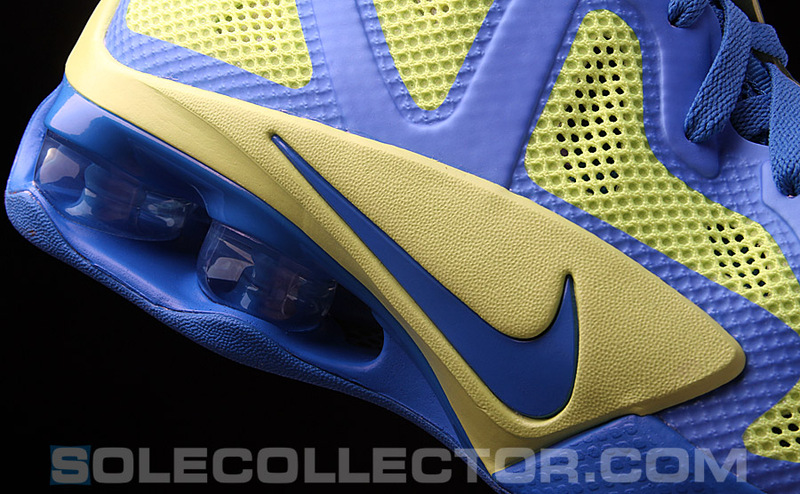 It was really about taking the Hyperfuse look and feel, and modernizing the Shox platform for it. Wray: The biggest thing was just pulling it in a bit. Even on the old Shox columns in basketball, the tail really stuck out a bit, and it was almost like a fifth column. In our original designs here, a few people on our team were still hung up on that fifth column, that little Avatar tail. [laughs] Fortunately, Leo was able to bring it in and make it work. It doesn’t stick out as far and looks a lot more integrated. NDP: Leo, did you have any experience designing a Shox shoe? What was different about it? Chang: I did some Shox shoes actually when I was in Running, but by the time I got to Basketball, not so much. Shox was a huge business for Basketball at the start of the last decade. They were doing a million pairs each. In Running, it was the same thing, and they were doing almost two million pairs of each model. I guess people just got away from the mechanical cushioning concept, and we’ve found that people have wanted to feel closer to the floor. NDP: And even more than anything, the older Shox didn’t feel balanced. It’s one thing to be in a heavy shoe, but a shoe that isn’t balanced is far worse. Chang: In terms of the tooling, we have a forefoot encapsulated Air unit, so you get that nice Air to Air transition from the heel to the forefoot and it should feel more balanced. I really started out by designing this bigger lateral support wing for some nice lockdown on the footbed for the bigger guys. At the time, it was also one of the lighter uppers that we were able to pull off for this kind of shoe. Whenever we put it on the scale, it’s the lightest upper we’ve ever done for a Shox shoe. 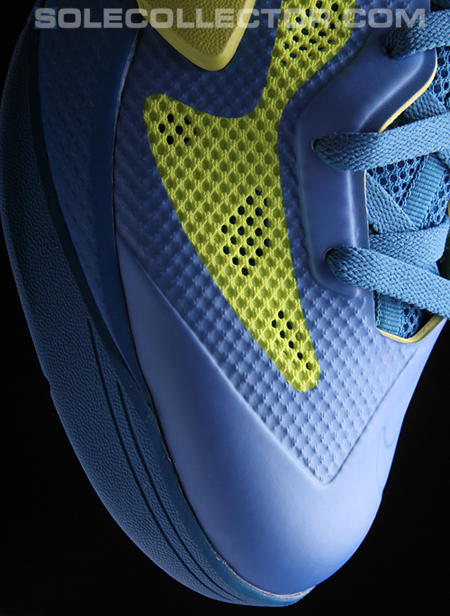 If you compare this to the Hyperfuse though, it’s a very comparable upper and they’re both very lightweight. Wray: The other thing too that we started to notice after the first Hyperdunk, is that guys in our D1 testing program really wanted us to make a lighter upper for a Shox shoe. They kept saying our older Shox approach was too heavy now, and they weren’t going to play in it. We’ve always tried to compare it to the full-length Max Air shoes we do, and not to the Hyperdunk, because it’s never going to be that light. Now though, we’ve gotten a Shox shoe to be the same weight as the Max Hyperdunk, and that’s an accomplishment. Chang: Exactly, and it’s for the guy who likes the full-length Max ride. If you enjoy those, you’ll definitely like this. NDP: So it’ll be worn by teams and on the college level? I think it helps that it shares a similar design as the Hyperfuse too, because a lot of teammates might want to wear the Shox version, while other guys can wear the Hyperfuse and they can all blend together on court. Williams: Yeah, and Leo and the team decided that this was going to be a big team play, and we wanted to re-introduce it to the market slowly and not just push it down people’s throats. We can combine the two cushioning units of Shox and Air, and give people a familiar upper from the Hyperfuse that’s more modern. 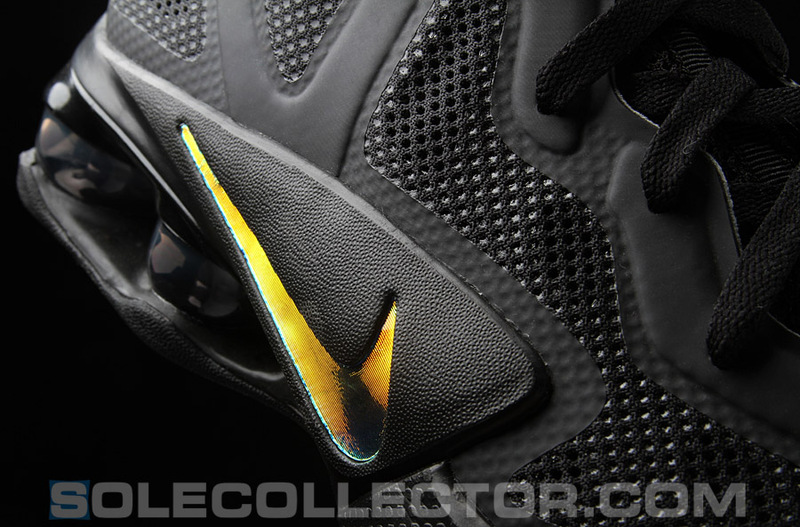 If you caught the playoffs, both Shawn Marion and Jermaine O’Neal were wearing them, and all of the rest of the Shox guys that have been wearing them on their own, especially Vince [Carter], have really had great feedback for us. Even online, it’s gotten some favorable comments. If you think about the consumer that’s 16 or 17, Shox is really old to them. Even when they see it in this new form, that’s what they wore in elementary school, so they might not want that anymore and that’s the challenge that we have. Zac Dubasik: Was there any discussion around using a more traditional Max housing with the columns inside? Like what we saw a handful of years back with the Shox Limelight and Spotlight? Williams: Not really, because this was really the story with the shoe all along. 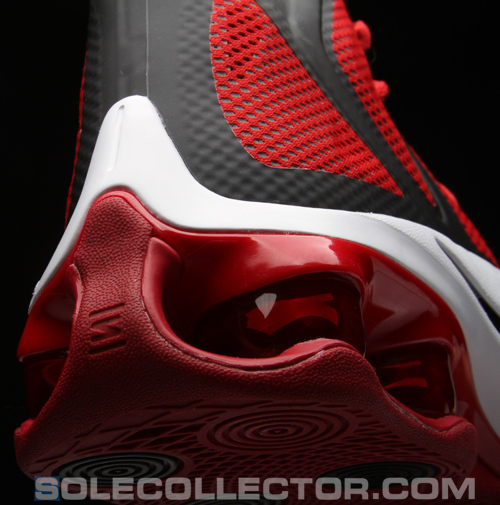 We wanted to bring back mechanical cushioning and start to introduce it to people that were the Shox consumer. There’s been Shox in Training, Running and Women’s Running, but ultimately, the innovation and performance of Shox was really born through Basketball. NDP: Of course. Vince jumping over a dude at the Olympics didn’t hurt. Williams: That’s how consumers viewed it too, and it was a staple in our line. 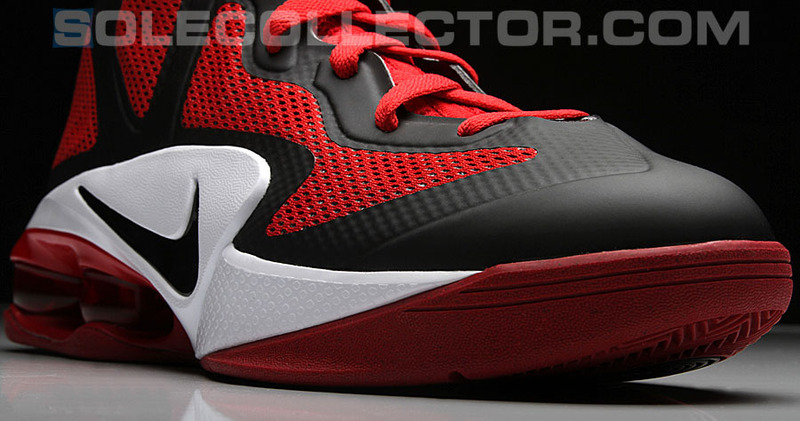 We can always do a Max platform, and we have the Max Hyperdunk 2011 that guys like Chris Bosh will wear. We’ll always do that, and the goal here is to expand the line. Some things aren’t going to work, and some things aren’t going to be for everybody, but what we try and do is really make sure that we’re continually pushing and providing options. It sounds corny, but one of our maxims is, “The consumer decides.” My job is to not only get it out there, but make sure it’s not corny when it gets out there. As long as it has some of the proper attributes that people want, I think once people give these a shot, put it on and play in it, they’ll like them. The great thing about this new setup too is that we can really work on versions that might be off the beaten path. We can use our DCS coloring process to give more life to the columns. That Shox unit is actually five different pieces along with the four columns. There’s the pebax plate, the moderator plate, the wedge and all that good stuff. Now, we can go in and do multiple colors and tell a cool story. NDP: Is it safe to say that the older PU-based Shox columns are entirely done for then? Williams: We won’t be using those again. I can’t speak for another category, because that configuration may be used in Running or Training again, but for us, when we do mechanical cushioning with respect to Shox, it will be in this new form. We won’t use PU again. I say that with all of the confidence in the world, because nobody in Innovation is saying, “Hey, I have an unbelievable breakthrough with PU.” This is the breakthrough.